At first I noticed tiny white lint-like material on people's coats and in the air. As I strolled south through Union Square, coats were more heavily covered in what turned out to be small white feathers. It was clear that something serious was afoot and soon the source was revealed: a massive pillow fight. Pillows of all colors where flailing about with the pavement deep in feathers and stuffing. More photos here. 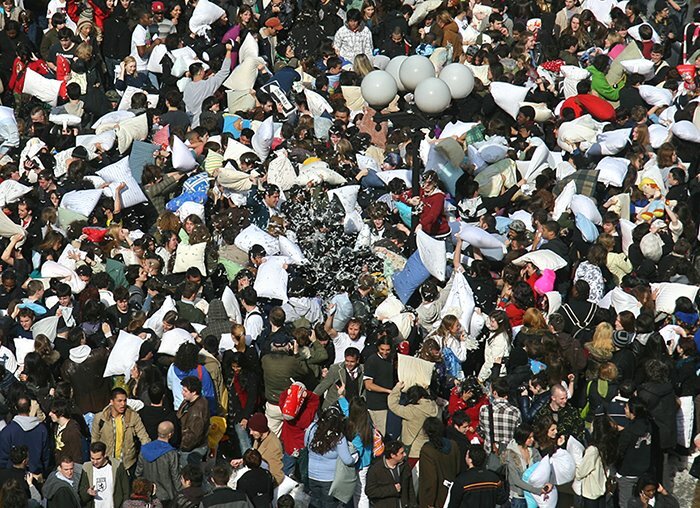 There may not be an overarching reason for this pillow fight, but there was plenty behind its origin - the annual event appears to have evolved from the pillow fight flash mob, although the official website warns: "We must begin with a simple request: please do not call your pillow fight a "flash mob". Massive pillow fights predate flash mobs by at least a decade, and calling it a "flash mob" cheapens your event: it brings to mind images of anonymous, mindless zombies, assembling in public briefly to bewilder passersby and disperse, having never milked the sweetest benefits of a free public gathering. Pillow fights are not flash mobs." A flash mob is a specific form of smart mob - a group of people who assemble suddenly in a public place, do something unusual for a brief period of time, then quickly disperse (the term flash mob derives from flash crowd - a term coined in a 1973 story called Flash Crowd by science fiction writer Larry Niven.) A smart mob is a form of self-structuring social organization through technology-mediated, intelligent emergent behavior. The concept was introduced by Howard Rheingold in his book Smart Mobs: The Power of Many. This was written about in 2002 in a New York Times article by Clive Thompson: The Year in Ideas; Smart Mobs. "In Smart Mobs: The Next Social Revolution (Perseus; 288 pages) he describes how large, geographically dispersed groups connected only by thin threads of communications technology -- cell phones, text messaging, two-way pagers, e-mail, websites -- can be drawn together at a moment's notice like schools of fish to perform some collective action." Teenage "thumb tribes" are often cited as the origins of smart mobs, from oyayubizoku in Japanese, which means "clan of the thumbs" or "thumb tribe." In Tokyo, teenagers would assemble seemingly spontaneously, using text messaging on cell phones to organize. In working on this article I came across the site www.wordspy.com. It is a good source if you would like to learn more about terms like smart mobs, flash mobs, thumb tribes, flash campaign, flash crowd, crowdsourcing, culture jamming, swarm logic, microblogging, lifestreaming ... If you're not familiar with microblogging, check out Twitter. Note: See the article on the origins of the first Flash Mob in 2003 in Fibreculture .